One of the reasons I was keen to renew my Ancestry membership was because the organisation has just released a new collection of Masters and Mates certificates for Great Britain from 1850-1927, as sourced from The National Maritime Museum at Greenwich. Some years ago I went to London to seek out the Register entries for my CUMPSTON relatives who were all Master Mariners. I was able to abstract all their register of sailing entries, including ships and dates. but never got to see their actual certificates – so what joy this evening to be able to download them. 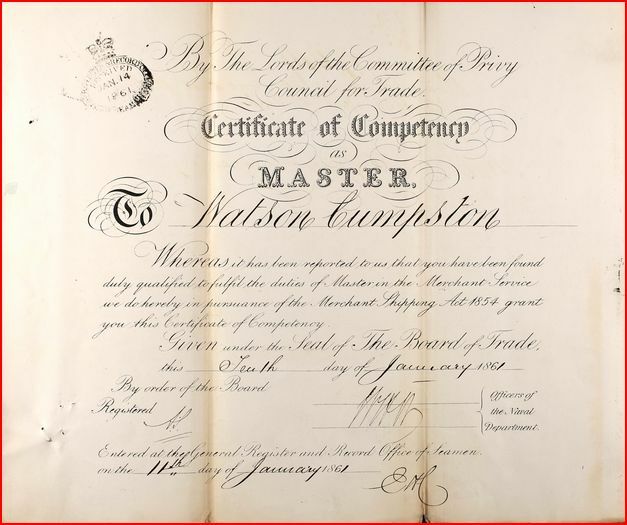 I found 2 certificates for my 2 x great grandfather Watson CUMPSTON – the first certificate showed him aged 24 born in 1833 in Hull, with a certificate of competency as ‘Only Mate’ dated 30th October 1857. The second dated 1861 was as a ‘Master’. and Thomas Cumpston dated 1851 – a beautiful Mate’s certificate showing that he had worked for 25 years in the British Merchant Service in the ‘Foreign Trade’. The collection is available at http://search.ancestry.co.uk/search/db.aspx?dbid=2271. Do let me know if you are related to any of these people. 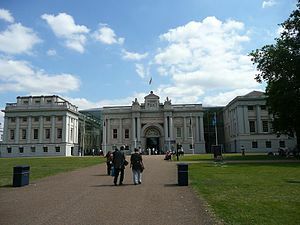 This entry was posted in Cumpston people, Research resources and tagged Charles West Cumpston, Cumpston, Greenwich, Kingston upon Hull, National Maritime Museum, Watson Cumpston. Bookmark the permalink.